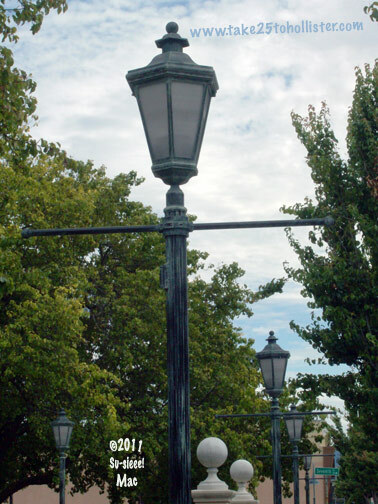 Doesn't it almost look like these lamp posts are dancing? And, right in front of the Veterans Memorial Building. 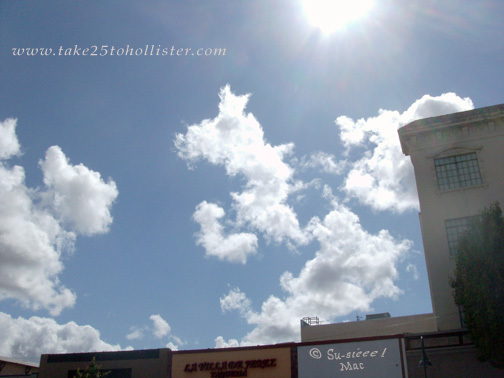 It was raining when we came out of the movie theater in Hollister yesterday evening around 6:30. Not just a sprinkle, but a pouring. It was gently raining when we came out of La Villa de Jerez an hour later. 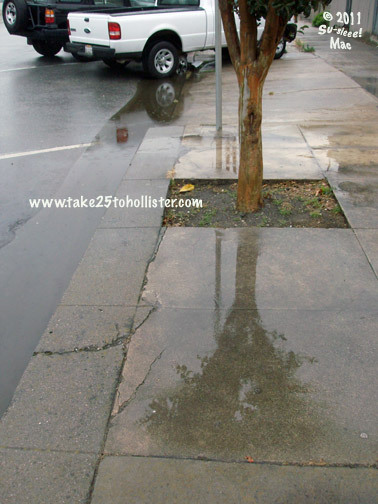 The photo shows how much water was on the sidewalk and gutter by then. Amazing! We really live in a mountainous area. 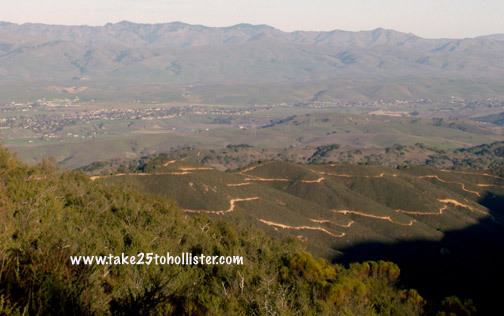 This photo was taken from Fremont Peak, which is in the Gabilan range. The mountain range across the valley is the Diablo range. 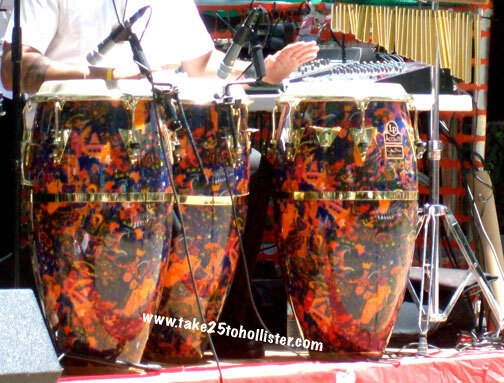 This week (June 20 to June 27), I will be posting photos that I took last Sunday in downtown San Juan Bautista. 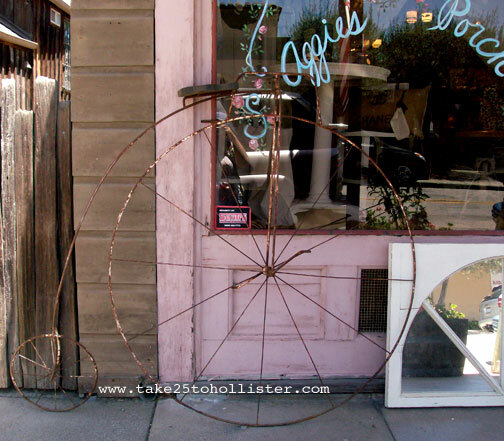 That there bicycle skeleton leaning against the antique store is a penny-farthing. Sorry. I didn't take a really close look to see if it is an actual penny-farthing frame or a metal sculpture of the penny-farthing. Penny-farthing. Sounds like a coin with a gas problem. 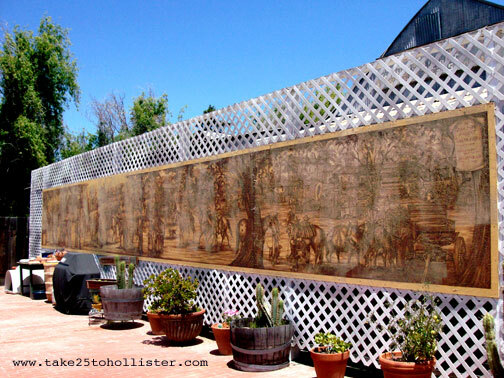 This fading mural sits in somebody's back yard. 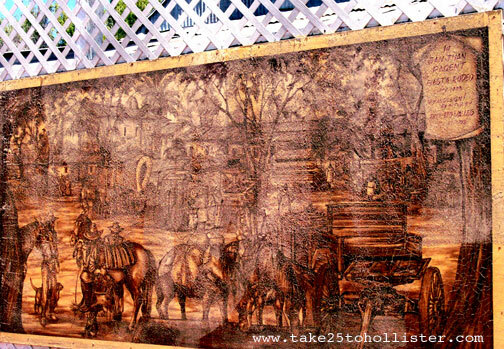 It depicts the San Juan Bautista Fiesta and Rodeo that used to take place every year since at least the early 1900s. The mural was done in the 1970s by artist Ernesto Valles, who also did the Hollister mural on Fifth Street. Here's a closer look at a section of this San Juan mural. 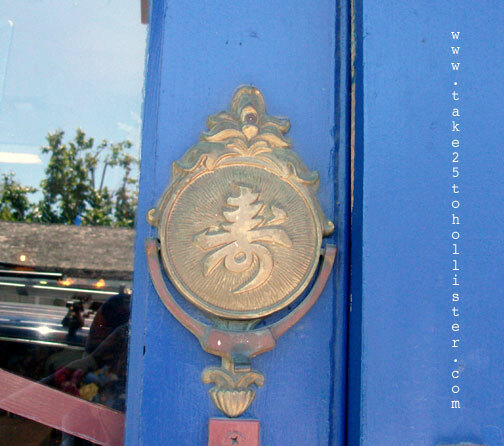 A fixture—a knocker, I believe—on the door of the Orient Express, the Chinese Restauarnt in town. The address is on Washington Street. 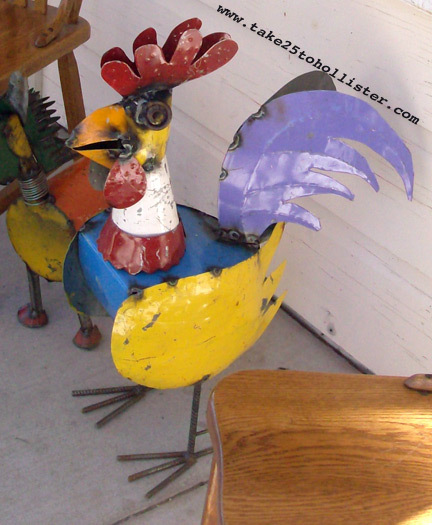 When is a chicken in San Juan Bautista not running wild? When it is an item in a gift shop in that town. 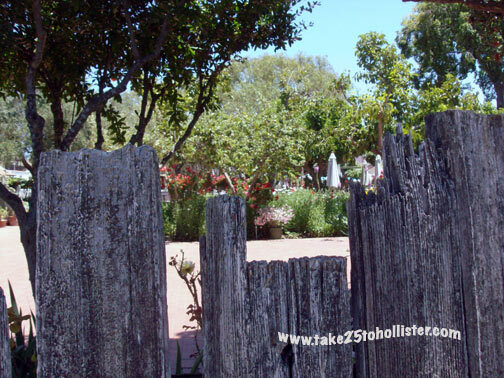 Peeking through the back fence on Fourth Street at the patio of Jardines de San Juan. 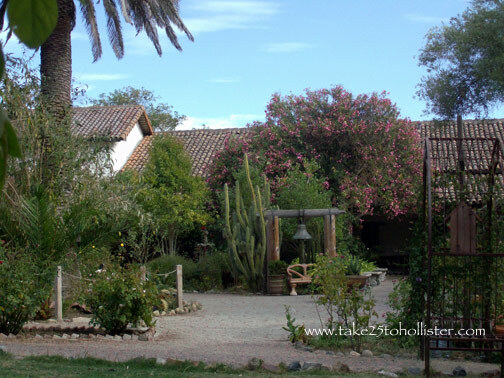 San Juan Bautista is known for being home to one of the 21 California missions that were founded by the Franciscan friars of Spain. It is also known for the chickens that run wild through the downtown streets. Many tourists think the wild chickens are quaint. Many San Juan residents think otherwise. Check out this story about the Mission City's decision to hire a chicken wrangler to thin out the flocks. Last Sunday was the annual fiesta celebrating the 214th anniversary of the founding of Mission San Juan Bautista on June 24, 1797. A great band was playing that sunny afternoon. Wish I'd caught the band's name. 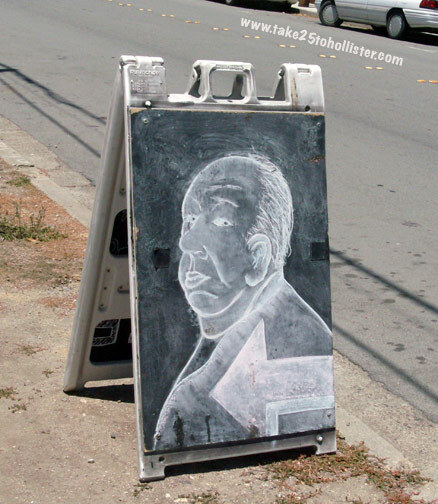 Hitchcock in San Juan Bautista? I was wandering around downtown San Juan Bautista yesterday with the camera, of course. So, I think I shall do another week (June 20 to June 27) of photos of the mission city. The arrow points to—what else—Vertigo Coffee Restaurant/Cafe at 81 Fourth Street. It's cherry season. Hurrah, hurrah! 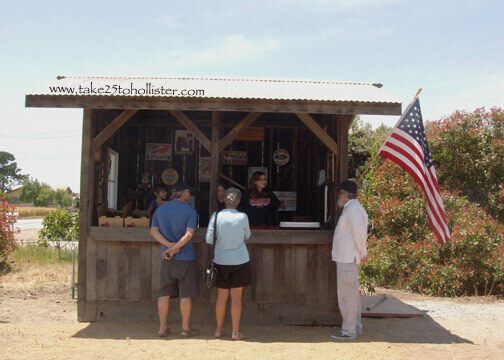 The Ivancovich Family Orchards' cherry stand on Buena Vista Road is now open for business. Hurrah, hurrah! It's the husband and my favorite place to go for freshly-picked local cherries. Three dollars a pound. They've got both the deep red and the red/yellow types. The stand is located at 2420 Buena Vista Road. If you're traveling on highway 156, you'll see a truck with a huge cherry sign on the south side of the highway at Buena Vista Road. Just follow the signs to yummy delicious cherries. The stand is open every day from 10 a.m. to 6 p.m. They hope to stay open until at least the Fourth of July. "What?" the husband braked hard. "Gotta take a picture," I said, opening the door. This is at the corner of Best Road and Highway 25, opposite the Ridgemark Golf Course. The mountain peak in the distance is Santa Ana Mountain. Yep. 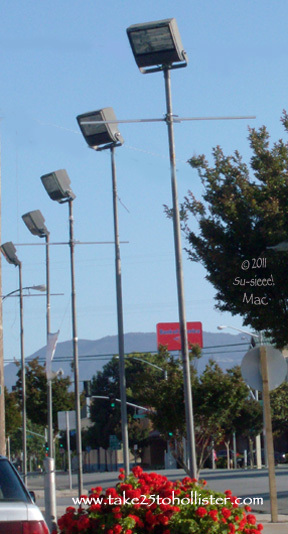 Some lamp poles on San Benito Street in downtown Hollister. Today is Farmers Market Day! 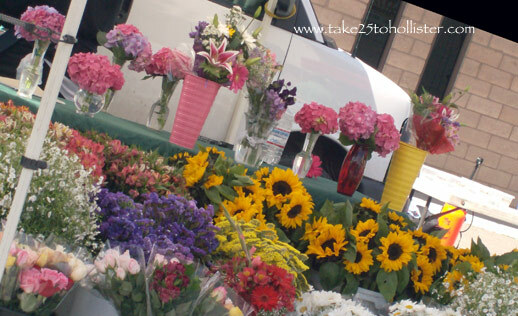 If it's Wednesday, then it must be the Farmers Market in Downtown Hollister. Need I say more? But, if you need more, click over to the local Farmers Market's Facebook page. 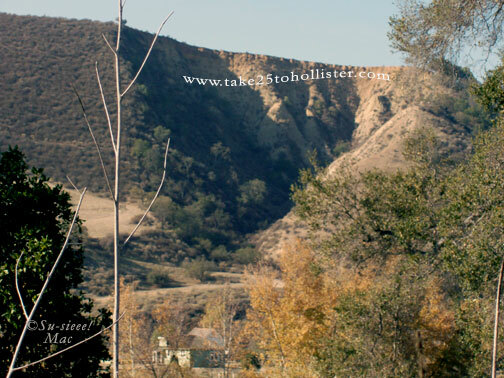 Recognize this spot at the northern end of downtown Hollister? Anyone recall what used to be here? And, what was used? I wonder if this lot will ever be home to anything again. We were waiting for our order at the Burger Factory when the husband asked, "How are we going to get around when we can no longer drive?" "We can walk. Ride our bicycles," I answered. "Take the bus. Take a taxi." 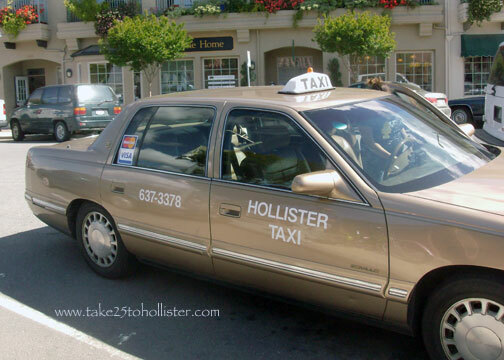 "Hollister doesn't have taxis," he said. "Now there are," I said. "Maybe one or two," he said, as we stood up to get our order of teriyaki chicken, egg rolls, and Philly Cheesesteak. Lo and behold, the next day, we saw a taxi. 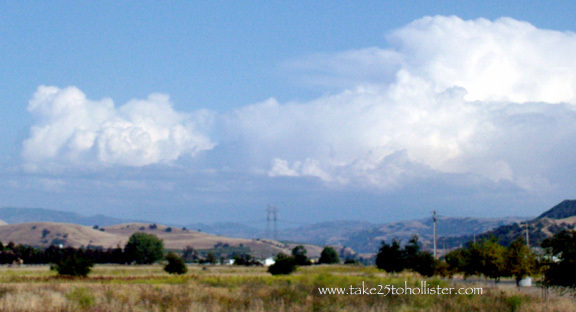 When I moved back to Hollister several years ago, I didn't realize how much I missed the open skies. 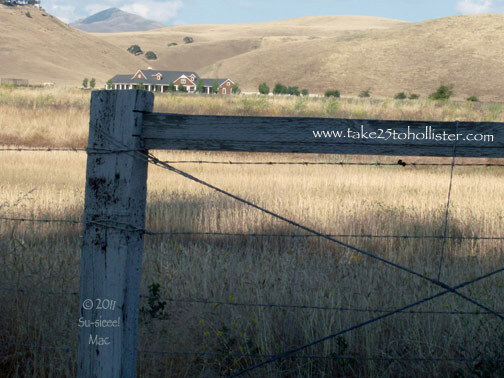 This specific view is just a few miles south of downtown Hollister, off of Highway 25. You're looking northeast from the corner of Best Road and Airline Highway (aka Highway 25). I wonder where those clouds were coming from? They looked to be moving southeasterly. This was taken on the day I went chasing clouds. Tuesday afternoon, after voting, I spied the tippy-top of what looked like growing thunderheads over the Rancho San Justo Gym. Very strange since it was a clear day. Of course I needed a photo of them. The clouds weren't as nearby as I thought they were. 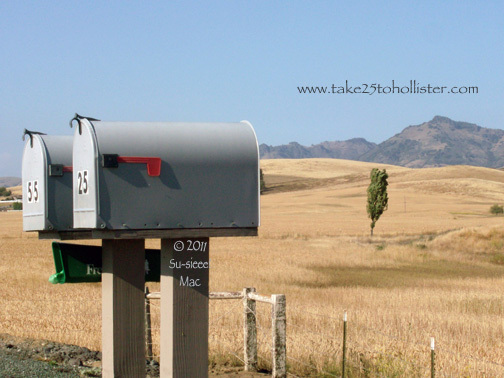 The further we drove up Airline (Highway 25), the farther away they were. Here's a close-up of them from Best Road. 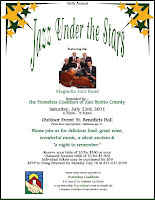 The Homeless Coalition of San Benito County will be holding its sixth annual Jazz Under the Stars on July 23, 2011 at St. Benedicts Hall (1200 Fairview Road) in Hollister. The outdoor event will feature the Magnolia Jazz Band. 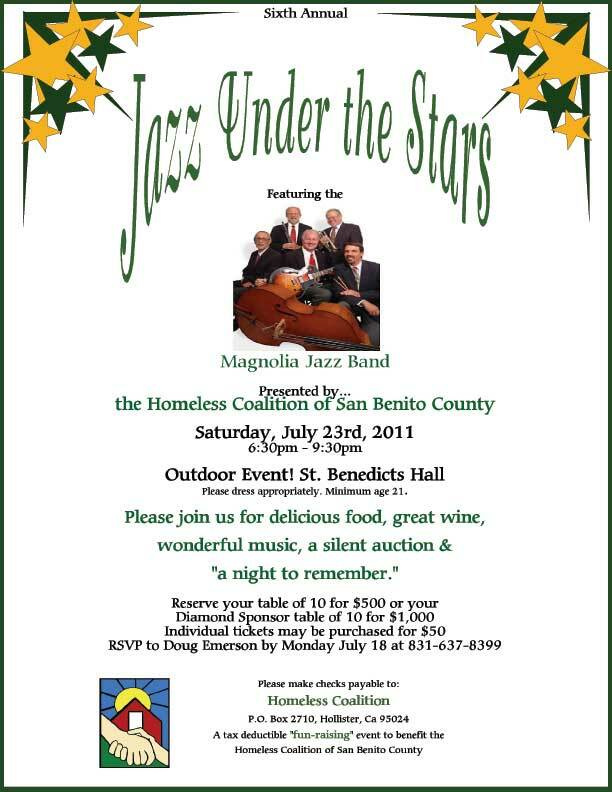 According to Doug Emerson, a board member of the Homeless Coalition, "This is the major fundraising event for the Homeless Coalition of San Benito County. The Coalition's primary source of revenue for the past years has been CDBG grants (Community Development Block Grant); we have received $100,000 – $110,00 yearly. However, due to changes at the Federal and State levels, there will be no CDBG grants in 2011. As a result, it will be a struggle to keep the shelter open next winter. Attending Jazz or making a monetary donation will go a long way towards keeping our shelter open." For information about the Homeless Coalition of San Benito County, click over to its Web site. 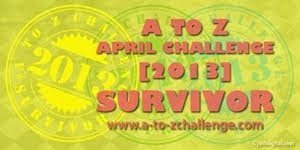 For more details about the fundraiser, click here. You can also click on the poster image below to enlarge it for easier reading. Yes, there will be no Hollister Independence Rally this year. More than likely the one in 2008 was the last one. No city-sanctioned bike rally. Got it. But, that doesn't matter. 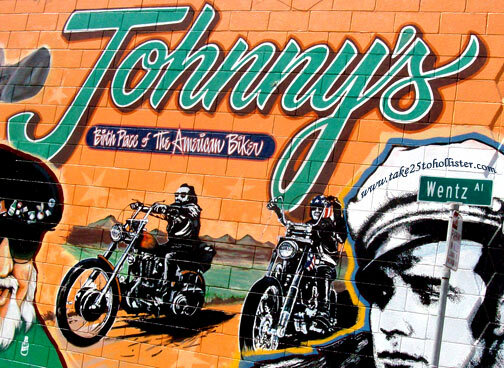 The Hollister "Birthplace of the American Biker" Independence Weekend will be going on. So, from Friday, July 1 through Sunday, July 3, we, locals, should expect to see and hear a lot of bikers coming through town. In fact, on Saturday, July 2, bikers will be riding in from Southern California. They will start in San Dimas at 6 a.m., rocking their way up through the valley, down Pacheco Pass, and rolling into Hollister around 1:20 p.m. To learn more about the ride, head over to the 2011 Southern California Hollister Rally Run Web site. P.S. If you'd like to know about the July 4, 1947 event that lead to Hollister being called "Birthplace of the American Biker," click here. Yes, it's another local summer event to put on your calendar. Why not? It's summer! Yes it is. Don't let that weather fool you. 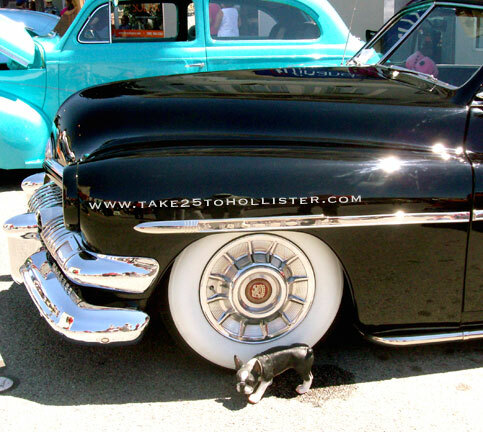 This event is the 25th Annual Street Festival and Car Show. The city closes down San Benito Street between South and Fourth Streets. The old cars are lined up at the south end. There will be food vendors, booths, demonstrations, and five bands. Free watermelon, too. For more detail, check out this link. 2010 Saddle Horse Show and Rodeo Parade. Click here for more photos. 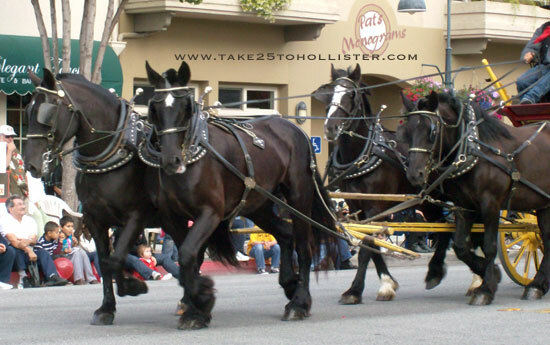 The 78th Annual San Benito County Saddle Horse Show and Rodeo will be held June 24 to June 26, 2011 at the Bolado Park Fairgrounds. 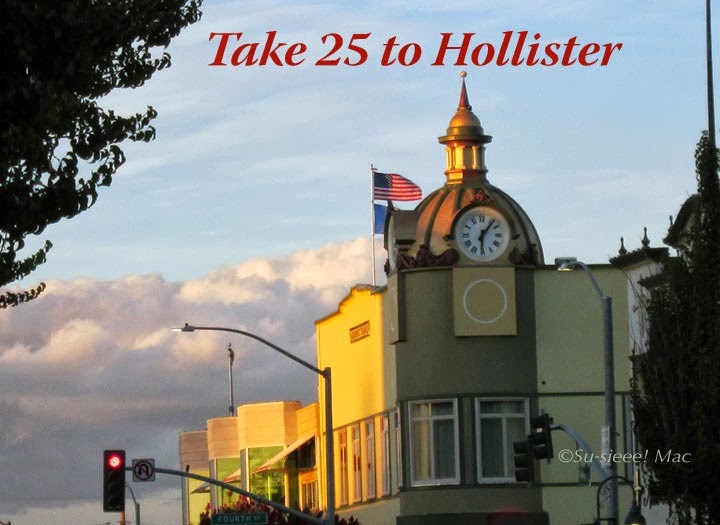 As usual, it will kick off with a parade through downtown Hollister on Thursday, June 23, around 6 p.m. For more details, click over to the rodeo's Web site. Next Sunday, June 12, 2011, is the annual Portuguese Festival Parade. It starts at 10 a.m. from the S.D.E.S. Hall on the corner of Seventh and College Streets, near Sacred Heart Church. For local stories about this event, click here. Have faith! Blue skies are out there. 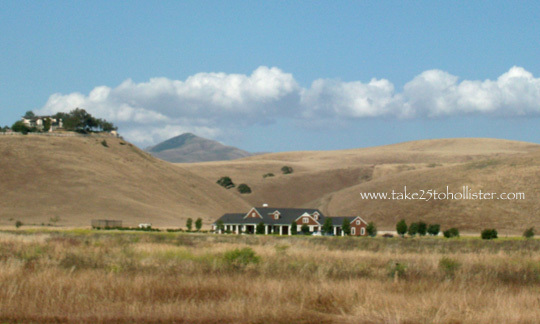 I would like to walk up to that ridge above the San Benito County Historical Park, which is just a mile south of Tres Pinos on Highway 25. What a breathtaking sight to behold, I betcha. Big Barn Sale, a fundraiser for the San Benito County Historical Society, 9 a.m. to 4 p.m.
For more details, check out the San Benito County Historical Society Web site. 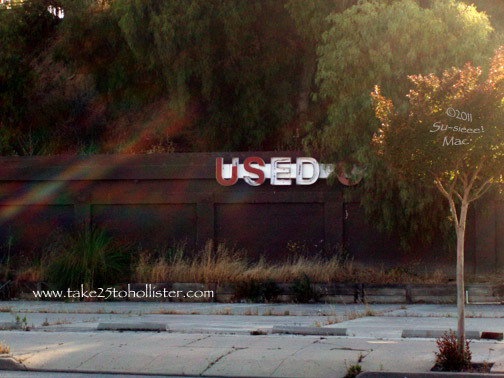 Yesterday, I saw signs of another new business starting up in downtown Hollister. Hurrah! 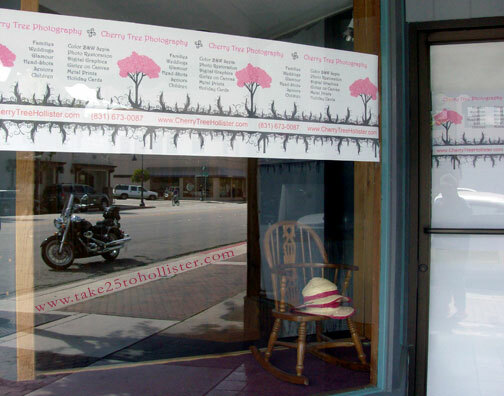 Cherry Tree Photography will be occupying the former Maddux Jewelry storefront at 535 San Benito Street. For info about the business, check out its Web site. Yep, this sign is for real. 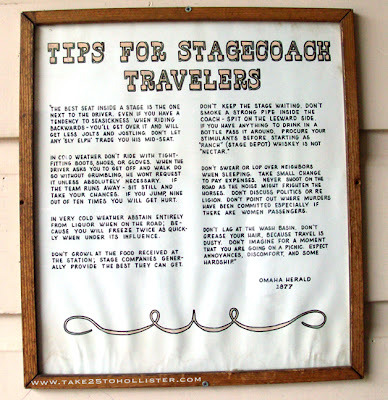 It's hanging in the Plaza Stable at the San Juan Bautista State Historic Park in, of course, San Juan Bautista. Every first Saturday of the month the park holds a Living History Day. What to you know? There's one this Saturday, June 4, 11 a.m. until 4 p.m. Here's the link for more details.